When I first arrived to Nome, I was actually shocked. I remember watching, through TV, America: New York, California. Thinking that every-- every place in the United States is utopia. You know, it’s very civilized and metropolitan? But when I arrived to Nome, I felt Nome was a little backwards. I envisioned what South Korea looked like in the 1960s: it’s small; very countryside; little outdated things. You know, how things are run here. System-wise, politics-wise, living-standard-wise, I was very disappointed. And at same time, I was going through some unhappy and depressive stage; because [of the] language barrier, I didn’t have any friends. The restaurant business [was] something brand new to me, and so I was very skeptical and didn’t have a positive attitude about what I had to do from that point on to make my family living. When I started working here [at Milano's Pizza], I was expecting the face of Caucasians [t] come in as customers. But when the, the Native Alaskan was coming in, thinking that they were Koreans because was some similar features! I didn’t expect that. ... I thought that, "Wow, this is unbelievable!" How I didn’t have any imagination how America will be this way. ... As time passed on, I developed some friendships, and regular customers would come in and out, and -- granted that I had some language barriers, you know, it’s not all about verbal communication -- [I] was able to communicate non-verbally. And develop some friendships and closeness with the community. And so I'm very happy how things have progressed. That’s one of the reasons [that] kept me to stay here. I'm very happy at this moment, this time-- what I have accomplished. And I want to continue to live here, and ... I want to do some good things for the community as well. Give back. I'm very happy at this time. 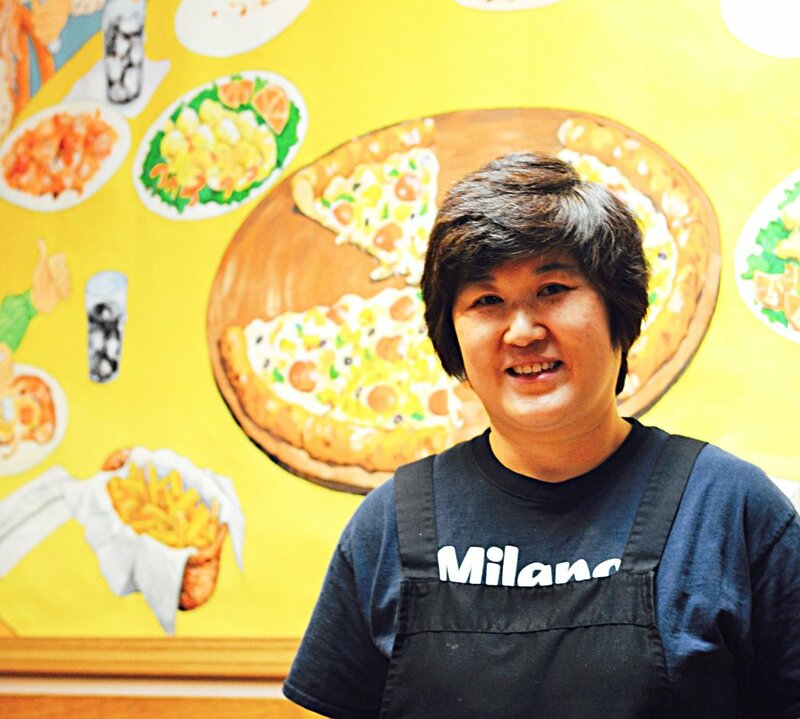 Kyung at her restaurant, Milano's Pizza, in downtown Nome. I came to United States shortly after my husband. He came in, to Alaska, to look for opportunity for the family. To make [a] living. His older brother happens to be already in Anchorage, living with my husband at the time, so they sponsored him [my husband] to come in. There was an opportunity, by mutual friends, to start a restaurant here [in Nome]. And then so, for a few years he came in [to Nome], settled in, and then I got invited to come in and to live together and run the business together, [Milano's Pizza]. 1997 is when I arrived. "I felt that it was definitely a connection, that Eskimo families are family-oriented. They love the family member[s] and care for each other. That was something that I felt, there was a definite connection." There’s several Korean-owned business members here, so I'm in the middle-- I think I function as the organizer, you know, as the leader amongst the Korean community? Trying to advocate [for] people to get together ... and serve the elders, you know, provide some meals, and do stuff. So I'm in the midst of getting things [together], and start taking care of some elders in a way.